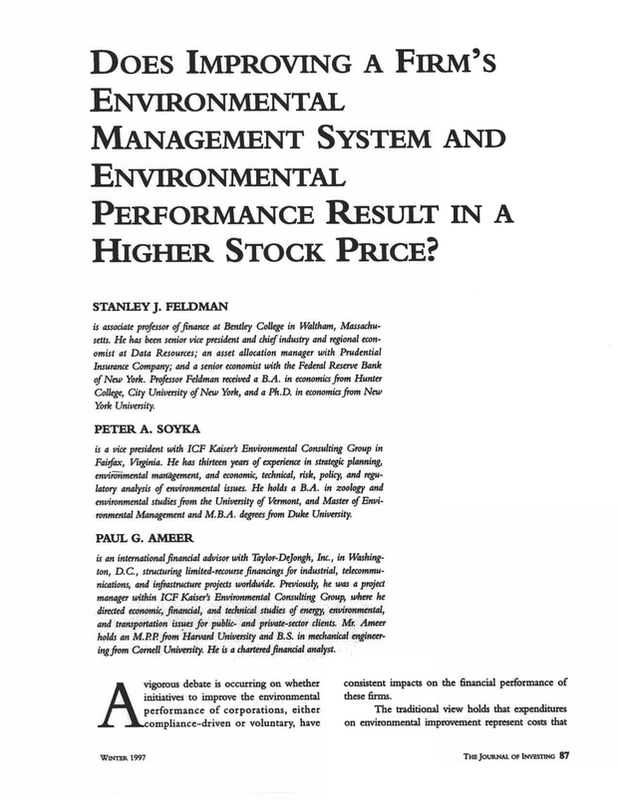 Does Improving a Firm's Environmental Management System and Environmental Performance Result in a Higher Stock Price? Associate professor of finance at Bentley College in Waltham, Massachusetts. He has been senior vice president and chief industry and regional economist at Data Resources; an asset allocation manager with Prudential Insurance Company; and a serior economist with the Federal Reserve Bank of New York. Professor Feldman reaived a B.A. in economits from Hunter College, City University of New York, and a Ph.D. in economics from New York University. A vice president with ICF Kaiser's Environmental Consulting Group in Fairfax, Virginia. He has thirteen years of experience in strategic planning, environmental management, and economic, technical, risk, policy, and regulatory analysis of environmental issues. He holds a B.A. in zoology and environmental studies from the University of Vermont, and Master of Environmental Management and M.B.A. degrees from Duke University. An international financial advisor with Taylor-DeJongh, Inc., in Washington, D.C., structuring limited-recourse financings for industrial, telecommunications, and infrastructure projects worldwide. Previously, he was a project manager within ICF Kaiser's Environmental Consulting Group, where he directed economic, financial, and technical studies of energy, environmental, and transportation issues for public-sector clients. Mr. Ameer holds an M.P.P. from Harvard University and B.S. in mechanical engineering from Cornell University. He is a chartered finandal analyst. You are going to email the following Does Improving a Firm's Environmental Management System and Environmental Performance Result in a Higher Stock Price?